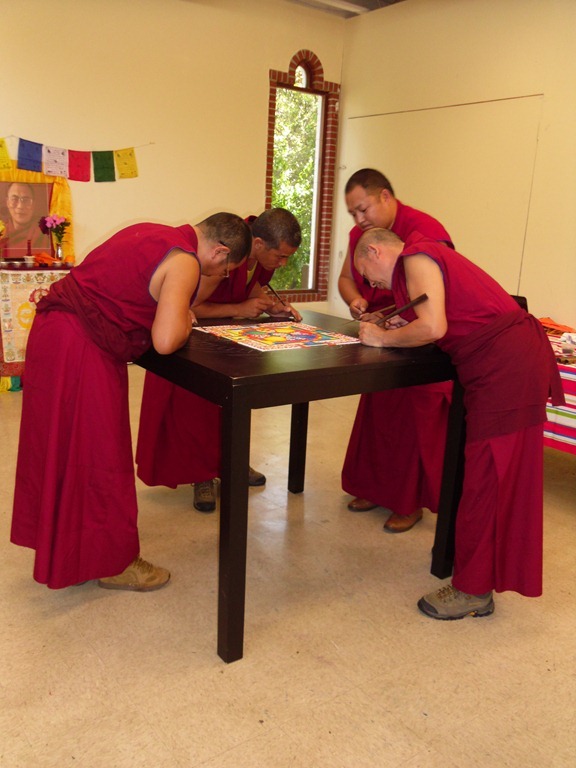 The monks from the Drepung Loseling Monastery of Dharmsala, India, arrived in San Luis Obispo CA Tuesday to create a â€œsand paintingâ€ mandala for world peace. They set up in the SLO Art Museum for three days. Visitors were free to come and go and observe the process. 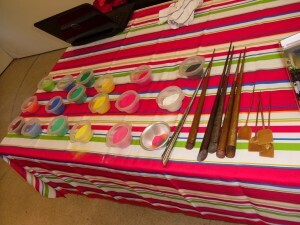 On a side table, the monks had laid out their little bowls of colored sand. The sand is loaded into a long metal tool, a â€œChakpur,â€ that has serrated edges on the outside. 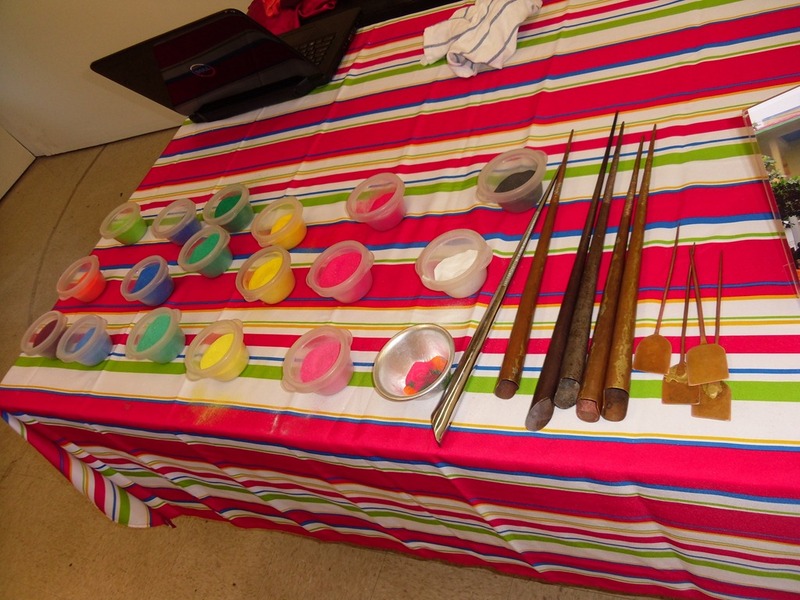 That funnel-tool is carefully placed on the area to be worked and another metal rod is rapidly scraped over the serrations, causing vibrations that gently, precisely release the sands where the monkâ€™s skilled hands want it to go. Yellow Hat Buddhist monk begins process of deconstructing the sand mandala, returning the sand to the earth by scattering the grains on the waters of San Luis Creek. After three days of incredibly intense work, the mandala was completed and carried outside for the final ceremony of changing and music. After which, a monk stepped forward and cut the circle, again and again and again. He then swept all the now mixed grains of sand into a pile to be distributed to any who wanted a small amount to take home to scatter around their home or garden. The bulk of the sand was then carried down to San Luis Creek to be gently scattered on the water, the grains to be carried by the waters down to the sea to join all the other grains of sand. And for the witnesses, the teaching remains: The impermanence of all things. Everything that exists has a beginning, a middle and an end. 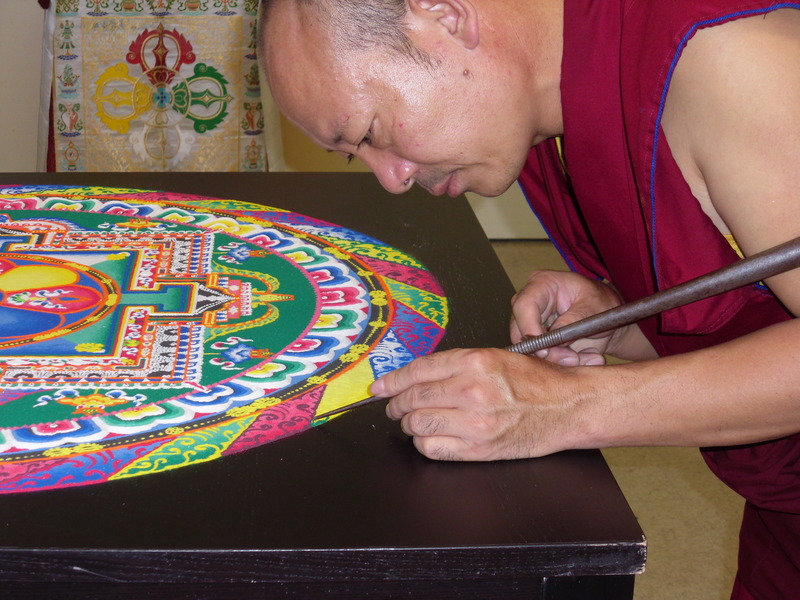 In the mandala, like life itself, the grains of sand are brought together for a brief time to create something of beauty and meaning and then are returned to their source as part of the whole once again. 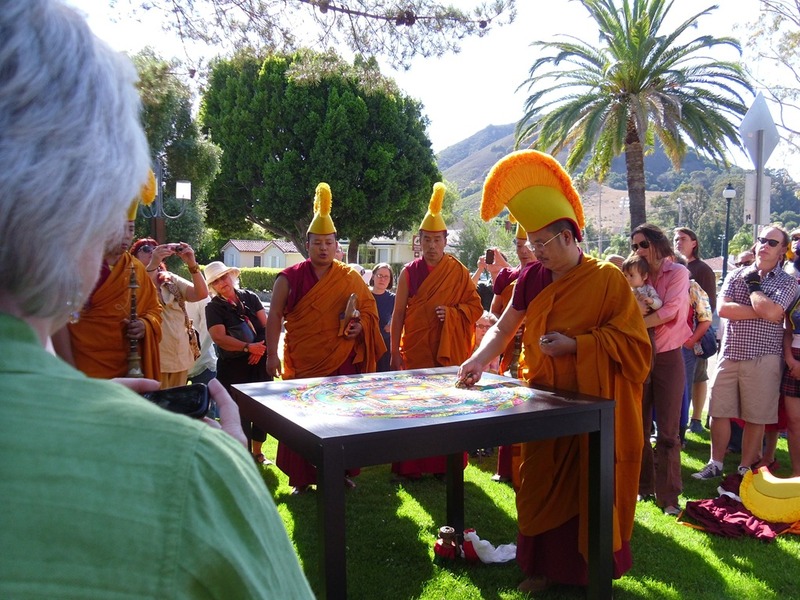 For more photos of the Buddhist mandala sand painting in San Luis Obispo andÂ more articles by Ann Calhoun,Â visit her blog calhounscannon.blogspot.Â Warning! Calhounscannons are normally opinion-packed, pithy and witty excoriation of all hypocrisy.